Foreword by Pamela Reynolds: I met with Ray and Lesley Sykes on the 6th July 2012, just after Ray's 70th birthday. Ray was born in Saltaire and he came back to visit his childhood home to share his memories with Lesley. I was privileged to sit with them over coffee in Salts Diner and hear Ray's stories. It was a lovely afternoon. On the 13th June, 2013, I received an email from Lesley with the saddest news: after a short illness, Ray had died the day before. I'm so glad I got the chance to meet Ray and Lesley. Ray's memories of Saltaire are moving, uplifting and funny. Ray Sykes was born in Saltaire in July 1942. His father, John Henry Sykes (known as Jack) was born in 1920. Ray's grandparents lived in 29 Shirley Street. They came from Barnsley in 1930. Ray's granddad was disabled and died when Ray was 4. Ray remembers his grandmother who seemed to cook all day. The house on Shirley Street was tiny. They didn’t use the front door, always the back and they would sit on the coal range for warmth. Twice a year, a ton of coal was delivered. There were 4 children in the family. Alice the eldest who, as an adult lived in Bradford; Ray's dad, John Henry (known as Jack); Arthur and Lena. Alice emigrated to Australia when Ray was ten and he lost touch with her. All the others have now passed away. Arthur died young of cancer. Lena lived in Baildon after her marriage. Lena went to see Alice in Australia once and stayed for three days before flying back to England. She never fully explained why she came back so suddenly, only that she couldn’t stay there. Ray's dad, Jack, worked as a boiler fireman in the boiler house, and shovelled coal all day to keep the boilers going. Twice a year, he had to clean the chimney, which meant going inside it, and got extra money for that. Ray's mum also worked at Salts Mill, which is where his parents met. Ray's parents married in 1940. Their wedding was at Saltaire United Reformed Church. His dad, Jack, was in the RAF and married in uniform. Ray was born two years later, and his mum stopped working at the Mill and stayed home to look after him. His dad was away on the North African campaign, and when he came back from war in 1945, Ray was 3. His father learned to drive in the desert, but never spoke about his experiences of war. The family lived at 9 Herbert Street, a tiny house. Ray's identical twin sisters, Diane and Christine, were born in 1947. Ray was the only one who could tell them apart. He remembers saying to his mother, “Don’t they make a noise!” Sadly, Diane died in 2007. Ray's dad had an allotment behind the URC church. His parents would ask him to nip to the allotment to pick a cucumber or some veg. Ray was told to go on his bike because this, his parents thought, would stop him from taking the short cut over the railways lines. At this time there were railings, but no fence and it was easy to cross the line. Ray would go out, leave his bike at the bottom of the street, and run across the line. He would then retrieve his bike and cycle home, his parents none the wiser! During school holidays, Ray took his dad's lunch to the boiler room. Ray remembers the huge boiler and a very hot environment. Ray's dad was a powerful man ; about 5’ 8” and very strong. Ray remembers a man called Geoff Portz, would could pick up an anvil with one hand, hold it up over his head and carry it down the room. His father used to carry it back in a wheelbarrow! Geoff Portz is still alive and lives in Canada. He became a world heavyweight wrestling champion. Ray's dad, Jack, did some shifts in the New Mill to cover for someone on holiday. One night, he was badly burned when he opened the boiler door and it blew back on him. He was locked in the area. He had to climb over the gate and make his way to the hospital at the top of Victoria Road. He was then sent to Bradford Royal Infirmary. He recovered but had scars on his arms and chest. The family moved to 2 Daisy Place when Ray was ten. It had 3 bedrooms, so was a little bigger. Ray's dad made a bath in the kitchen. Rushworth's grocers was at 1 Daisy Place ; it's now an estate agents. Ray remembers that Rushworth's had a walled garden. Daisy Place was closer to his grandmother's house at 29 Shirley Street, Next door to Ray's grandmother at no. 30, lived the Fletchers. Then there was Alf Faulds junk shop. The Nield family lived opposite. Mr Nield was a French polisher and had two children, Vivienne and Lizbeth. Ray remembers everything being handy. He would go to Rushworth's for a can of peas, then go to Hodsons to get some meat. There was a young woman called Dr. Moody who lived where the bookshop is now. She inoculated the children against smallpox and polio. She warned that swimming in canal could make them ill.
Next door to them, at No. 3, was a family called Ferris. They were involved with the Salvation Arm and their son, Peter was a trumpeter who played in the Joe Loss orchestra. Ray says, “Peter practised his scales over and over and everyone wanted to to lynch him he would start playing the whole tune and people would sit back and say ahhhhh! They were a lovely family.” Peter eventually moved to Bideford in Devon. Alf Faulds’ junk shop is where the Strand hairdressers is now. It was a kids’ paradise. Ray recalls, he was a bit like Steptoe and Son. He always used to sit outside and the kids chatted to him. He was a lovely old man. His wife owned a milliner's shop on Gordon Terrace, so he was probably one of the richest men in the village, though he always looked a bit scruffy. At the back of it in Shirley Street, it's exactly as it was ; still boarded up. He knew where everything was, though it was a big mess. Where the laundrette is now, was a butcher's shop and he was the first man in the village to get a television. There was a milliner's shop in Shirley Street. Ray remembers the lady who worked there. She had one arm and would measure a yard of cloth by using one arm and holding it with her chin. Then there was Jeffrey's Motor cycle shop on Saltaire Road. His son raced bikes and had an accident when racing in Italy. At the corner of Gordon Terrace, by Saltaire roundabout, was the Halifax Building Society. Where the petrol station is now, was a cinema. Of course, there were no licensed premises in the village but there were other cinemas around, including the Glen Royal in Shipley. There was also a cinema near the Branch pub. The nearest pub was the Rosse on Gordon Terrace. Ray went to Albert Road Primary School. His sisters went Wycliffe School. Albert Road School had a balcony running round and he remembers the Headteacher never came in the school entrance ; she came up through the fire entrance. The local MP, Geoffery Hirst, lived opposite the school. There was an old people's garden on the roundabout, and there was an air raid shelter on the land of the infant school. The children played in the shelters, though they weren’t supposed to. When Ray was eight, he “married” a girl called Judith in the shelter. The shelters are now gone ; there's just grass there now. Where the Rosse pub is, and behind the fish and chip shop, there was the church orchard. When Ray was about 8, he was caught scrambling back over the orchard wall with his pockets full of apples. He felt a hand on his collar, and he turned round to see the local police bobby who took the apples from Ray (and kept them! ), smacked him on the back of the head and told him he would be round to speak to his father. For a week, poor Ray was on tenterhooks, but the policeman didn’t show up. This policeman was well respected by the children of the village. He knew all the children's names ; everyone in the village, in fact. He wore a cape and could spin it off his shoulder, like a matador, and cuff a child around the ear at the same time. He lived on Constance Street. Policemen would change every 12 months. They all lived on Constance Street. For entertainment, Ray remembers going to the annual Conversazione held in Victoria Hall. It was a family event with food and music. It was a lavish affair and folk wore their Sunday Best. Ray remembers there were parents at one end of the hall and children at the other, and if there was any trouble, he would be mixed up in it by running around, or kicking a ball. Then there was a “do” for the grownups and Ray would be looked after by his grandparents. Ray passed his 11 plus and went to Bingley Grammar School where the school teachers swept down the corridors in mortar boards and gowns. The film, Room at the Top, by John Brain was made in Shipley. Boys from Bingley Grammar school were asked to be part of a scene shot in Bingley library. Ray was in the group of 15 boys to be filmed. Some were called, some weren’t. Ray remembers the iron bridge at the end of Victoria Road, crossing the River Aire. Heavy military vehicles had damaged the bridge. It remained open, but no traffic was allowed, only pedestrians. When Ray was 11, it was closed. A footbridge was put across the river instead. When Ray was about 15 or 16, he belonged to the cycling club in Shipley. It was run by a local person and around 20 members would cycle to Blackpool or Scarborough together, setting off at four in the morning, riding two abreast, a journey of at least 120 miles there and back. Ray was fit, and enjoyed the ride. Ray remembers having to watch cricket because his father played. He would sit on the grass rise in Roberts Park overlooking the pitch, hour after hour, with his mum and sisters and dog, hoping the ball would come towards him so he could throw it on to the field. It rarely came and it was usually a very boring afternoon. There was a long pole to get the ball out of the river. Every Saturday and Sunday, Ray watched his dad play, the family catching buses to the various grounds. Sir Len Hutton played for Windhill. Freddie Truman played for Pudsey. Freddie came down to Saltaire to play in the leagues. In his twenties, he was rough and ready ; a very fast bowler. He would practice in the nets in Roberts Park. Freddie would pick Ray up on his shoulders and take him down to the nets. He told him to stand still and not to move. He said he was the world's fastest bowler! Ray would stand in front of the wickets while Freddie bowled. He thought he was going to kill him! Ray remembers seeing Ken Dodd at the Alhambra when he was 16 and he was just starting off. Around the same time, Ray left school and went to work at John Blackhall barber's shop in Frizinghall on Bradford Road. The Stage Manager of the Alhambra used to come in for a haircut, and bring various celebrities with him. He brought in stars such as Eric Morecambe, Eddie Cochran and Dickie Valentine. A snappy dresser, Ray's dad used to get material from Salts Mill for Ray to have made up at a tailor's in Leeds. Ray worked at Blackhall barber's for three and a half years before moving away to join the Police Force in Devon. Ray's father was still working and playing cricket when Ray left. He was a boiler fireman, then he worked in Bradford as a white collar worker. He later moved to Stoke on Trent and became the area secretary for the Transport and General Workers Union. He lived in Stoke until his death. Ray's sister Christine still lives there. Ray is now retired after a long and successful career in the Devon & Cornwall Cornwall Police Force. 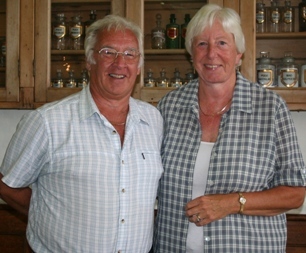 He returned to Saltaire on his 70th birthday in July, 2012, with his wife, Lesley. Over coffee in Salts Diner, Ray shared his memories of Saltaire with Pamela Reynolds, who wrote up these notes. Many thanks for sharing, Ray. Wonderful memories!